Improper Handling of Baby Chicks Can Cause Diseases & Bacterial Infections "During the spring of 1999, outbreaks of salmonellosis associated with handling chicks and ducklings occurred in Michigan and Missouri. This report summarizes the epidemiologic information for the outbreaks and provides an overview of legislative efforts to control the distribution of chicks and ducklings. The most likely baby chicks to be infected with salmonella, infection, and bacterial disease are chicks which are purchased from commercial sources because they could be exposed to these diseases during shipping even if they have not contracted it at the commercial farm where they were hatched. Studies indicate that baby chicks purchased from private owners with small flocks are less likely to carry disease or bacterial related infections. 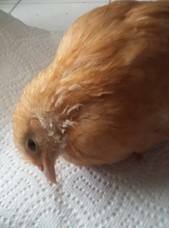 Purchase chicks from individuals or owners of small flocks. Be careful when handling new baby chicks. Wear gloves and face mask. Quarantine baby chicks away from the rest of the flock for 30-60 days before introducing them to the flock. During quarantine watch for signs of illness. or parasites. Make sure baby chicks bedding, feed, and water containers are cleaned and changed daily to reduce the chances of contamination caused by feces in food or water. Proper handling of eggs can prevent salmonella poisoning. Eggs should be collected daily and kept refrigerated. Eggs are safe from salmonella if handled properly. Salmonella can appear on the inside and outside of eggs. Keep eggs stored in the refridgerator until cooked. Eggs should be completely cooked and never eaten raw or lightly cooked. Xylose Lysine Tergitol 4: Typical colonies appear black or black-centered with a yellow periphery after 18-24 hours of incubation. "During February 2000, Centers for Disease Control (CDC) contacted 51 state and territorial public health departments to ascertain laws on the sale of baby fowl to noncommercial distributors and private persons; 28 (55%) responded. Ten (36%) states have laws restricting the sale of baby fowl for noncommercial purposes, including the sale of fowl aged 3 weeks (Indiana and Maryland), age 4 weeks in (Ohio and Pennsylvania), age 8 weeks in(Massachusetts and Virginia), and age 12 weeks in (Connecticut). In addition, Connecticut, Ohio, and Virginia require fowl to be sold in groups of greater than five birds. Illinois prohibits the sale of chicks during the Easter season, and Kansas requires persons to have a temporary or permanent license to sell chicks." Wry Neck Syndrome-Vitamin Deficiency. CHOE 2017.